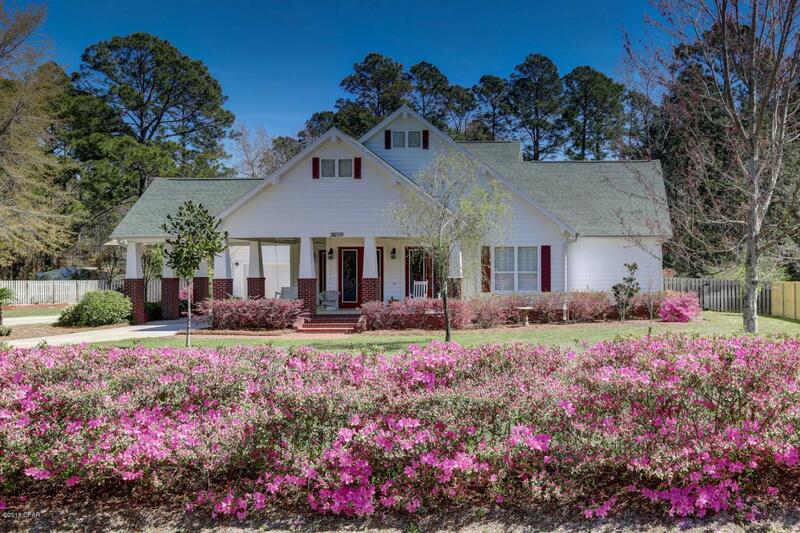 Awesome Craftsman style home 3/2 beautifully landscaped situated on one acre conveniently located to everything you would need. Attached carport for easy access to the wrap porches with swings and ceiling fans. Enter through etched glass double doors into the living room with wide plank Bruce flooring,built-in bookcase and 10' ceiling w/crown molding. Continuing into the dining room with double french doors to the porches and huge fully equipped kitchen featuring a 5 burner dual fuel range with a large oven and small oven, breakfast bar, island bar with veggie sink and instant hot water, custom cabinets, pantry and breakfast room. Continue to the large master suite and bath 7x16 walk in closet, double vanities and shower. Two additional bedrooms w/walk in closets and storageabove and a full bath. Laundry room w/sink and build in ironing board. 3 Car garage with workshop, floored storage above with room to stand up, can be converted to a room, equipped emergency power generator and connection, half bath plus a utility sink, Additional features include rinnai tankless hot water, 2x6 framing,Craneboard siding with lifetime warranty includes labor and material, Bose surround sound and outdoor speakers. 12x24 storage building with boatport. Numerous fruit trees and grapes. So many amenities to list. The seller has provided a list attached with the seller disclosure. Make an appointment and be prepared to be amazed! Owners will consider all offers.